The Public Organization “Kung Fu Federation of Kyrgyz Republic” was officially registered on 22 January 2013. Address: 720020, Kyrgyz Republic, Bishkek city, Oktyabrsky rayon, Samanchin street, 3a, ap. 47. Tel. : (+996 312) 549066; mobile: +996 (555) 93 14 48. Activities of the Federation are aimed at the development, promotion and popularization of Kung Fu in the Kyrgyz Republic, increasing the role of sports and physical culture in the harmonious development of people, strengthening the positions and prestige at national and the international levels. President of the Federation is Mr. Yury Dmitrushenko (born in 1974), who has graduated from the Institute of Physical Culture and is specialized in oriental martial arts; he is the author of the patented training programs on Kung Fu Sanda. The Federation implements its basic activities in the following directions: Kung Fu Taolu, Kung Fu Sanda, Self-defence. The Federation has four clubs attended by 100 trainees. The Federation is young, therefore its clubs are in the process of formation and development. 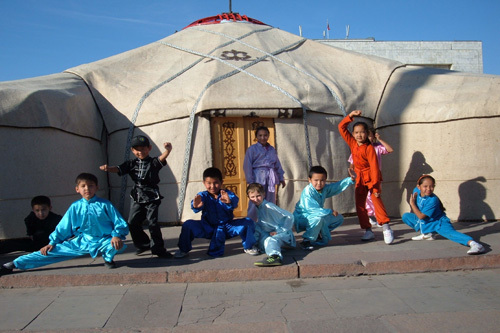 Champions and prize winners on Kung-Fu have been trained in the Kyrgyz Republic since 2004, when official competitions on Kung Fu Taolu and Kung Fu Sanda started in Kyrgyzstan.